The distinction between tu and vous is one of the most confounding aspects of French, and one of the most basic. The influence it has on verb conjugations, adjectives, and pronouns is considerable,* but more than that, the choice of tu or vous is a matter of etiquette: it defines the relationship between two people and how they interact, and using the wrong pronoun can have negative consequences. 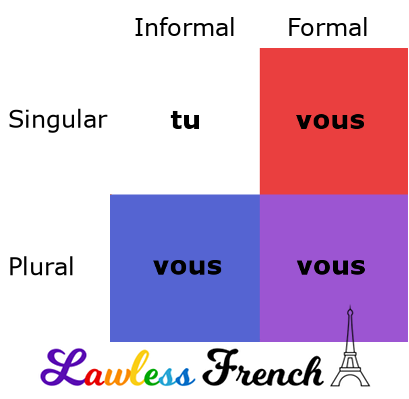 In a nutshell, tu is informal and singular, while vous is formal and/or plural. That is, if you’re talking to more than one person, it doesn’t matter what your relationship is – you always need vous. It’s only when talking to a single person that the choice must be made. While there’s only one word for "you" in English, formality and familiarity are of course alive and well. Hello sir, how are you? vs Hey man, how’s it going? Bonjour Monsieur, comment allez-vous ? Salut mec, tu vas bien ? English makes the distinction between formal and familiar relationships with word choice, varying grammatical structures, and optional titles. French does all of this too; it just adds another layer of complexity with two second person pronouns. So how do you know which one to use? The informal, singular subject pronoun tu (listen) indicates an intimate, amicable, and/or equal relationship between two people, and as such it is used with family, friends, lovers, colleagues, and classmates. Kids always use it with one another, as do most teens, even when meeting for the first time. Likewise, adult friends of friends often use it upon being introduced. Tu is also used when talking to God, children, animals, and inanimate objects. Using tu with someone who doesn’t fit any of these categories is likely to cause offense. The formal subject pronoun vous (listen) indicates a respectful and/or distant relationship. It’s used between strangers and in professional situations, such as doctor-patient and clerk-customer. It’s also used in professional and academic hierarchies, like boss-employee and professor-student. Using vous with someone who doesn’t fall into one of these categories demonstrates a certain distance, or worse. Remember that vous is also plural – always use it when talking to more than one person, even family, friends, and kids. Also see Verb conjugations and agreement with vous. In the above relationships, tu and vous are equal – both parties use the same pronoun when talking to each other. But there are times when one person uses vous and the other uses tu. The last one isn’t a rule, but I have heard it in more than one family, even after years of marriage and grandkids. There will be times when you’re not sure which pronoun to use, so what can you do? Generally speaking, you should try to let the other person speak first, to see what he or she is using with you. If that’s not possible, I prefer to start with vous, because the potential offense is less: if I use vous when it should be tu, all I risk is having the person think I’m a snob, and this is easily fixed. On the other hand, if I use tu when it should be vous, I may very well insult the person, which is far worse. That said, what you should definitely not do is just use vous with everyone because you figure it’s easier or safer. It will make your friends uncomfortable if you keep using vous after they ask you to use tu, which they’ll do by saying something like On peut se tutoyer or Tu peux me tutoyer. If you want to know if it’s ok to use tu, you can just ask: On peut se tutoyer ? Noun le tutoiement – "using tu" le vouvoiement – "using vous"
Verb tutoyer – "to use tu" vouvoyer – "to use vous"